I still need to post pics from Ireland. Internal media archival and sharing issues all up in chez nous. This week, however, has been about Violet being sick. She’s had a terrible cough, very low energy and has been eating very little. So she’s been home from school, swimming, etc., and hasn’t even wanted to play outside. As sad and heartbreaking as it’s been to see her feeling so bad, I’ve actually enjoyed getting some extra time with her. There was one night where she was having a terrible time coughing and couldn’t get to sleep. I had her on cough meds, she was slathered with vapor rubs, I had her propped up with the mister on, but she was still miserable. I sat with her in the low light, in the heavy humid air rubbing her forehead. She was cuddling with a stuffed llama. I was feeling that maternal connection to all other mothers before me who have nursed children in the night, and a special appreciation for Violet when she is her usual rambunctious self. She then held the llama out towards my face as if she were using the llama as a proxy for herself, to give me a kiss. I leaned over and kissed the llama. She’s feeling better today though. So much better that she asked for her notebook bound with an antique Japanese kimono that her aunt’s lab co-worker gave to her. 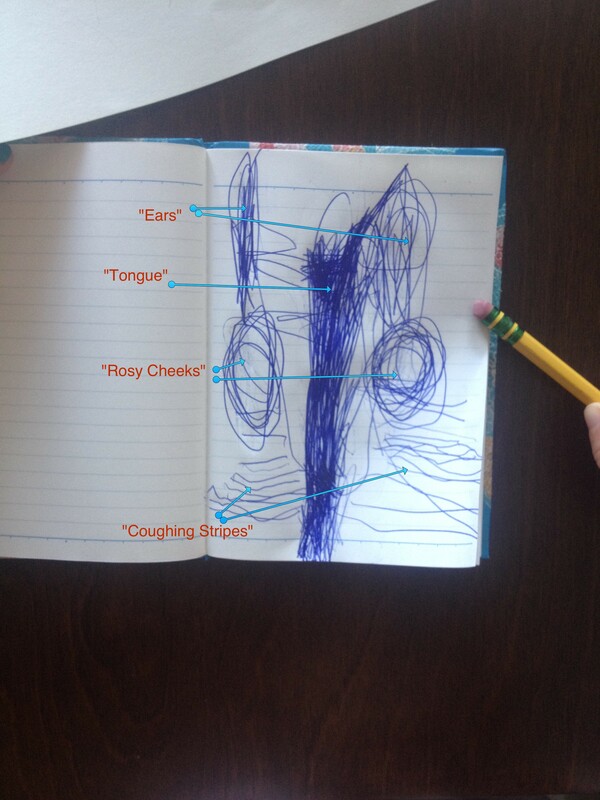 She drew a picture and told me that it was called “Super Sad Coughing Picture”. This post is amazing in so many ways.